This version also bring the Reversee Today Widget for all users! Settings now includes a couple of tutorials to uncover few known features like Editor Gestures and the iOS Extension. Paid users keep the same feature set as before, nothing changes. New users get a simpler version of the app. The PRO version brings all the features from the paid version plus Multiple Search Engines. Paid users who also buy/bought Multiple Search Engines become PRO. THE LITTLE APP YOU NEVER KNEW YOU NEEDED! - Webpages displaying a picture. - A higher resolution version of a picture. - Someone's social network profile. 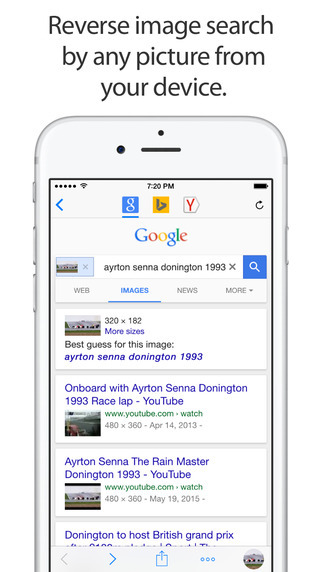 * Although the app allows you to search for pictures, it doesn't promise you will find results. That's the premise of all search tools. As stated before, the actual search is made by third parties, and even if they are the best on the business, none of them cover 100% of the searches. - Editor to crop/rotate the picture. - Smart navigation of your device photos: you can search by a picture in the middle of the camera roll and then come back to search for a picture nearby, avoiding to scroll the photos all over again. - Change the resolution of the image sent to the search engine (it may yield different results). - Open the results page in Safari, Chrome, Add to Reading List, Copy to Clipboard, Send Email, etc. - Save pictures from the web. - iOS Extension: Use Reversee inside other apps, like Photos, Safari, Chrome and any app that "exports" an image or URL. - Multiple search engines (Google, Bing and Yandex). 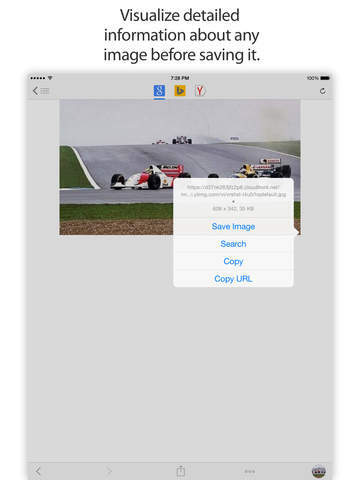 - Auto crop automatically removes the borders of a picture for you (very useful when searching by screenshots). - Editor gestures makes the app a complete image visualizer with navigation, zoom, reset, crop and also an option to save the cropped image to the Camera Roll. - Display detailed information about the image, like the URL, dimensions and file size. - Eliminate the 10-second delay from the Extension. 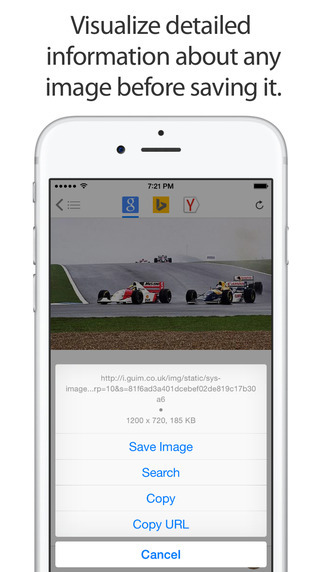 - Paste an image URL or any webpage URL. You can, for example, save the original image from Instagram. - Camera access inside the app. - Delete multiple pictures at once like you do in the Photos app. Google, Bing and Yandex are free services accessible from any web browser. Reversee is not endorsed by or affiliated with any of these search engines.